It was almost 2 o’ clock in the morning when we all gathered again around a table in Tiverton, West Country, still replete after a scrumptious dinner made of roasted sea bream and crispy kale chips. Bethany brought to the table a large bowl with a comforting chickpea and tahini soup. Soon after came a smaller bowl of home made labneh, sprinkled with a good pinch of za’atar and drizzled with extra virgin olive oil, then some warm flat bread to mop the soup directly from the bowl. We were definitely not hungry, but the cumin smell of the soup was so inviting, the texture so rich and comforting that we helped ourselves again and again, scraping the last bits of mashed chickpeas from the bottom of the bowl. Bethany has a special way to everyone’s heart, it’s just not her contagious smile or fresh liveliness, it’s how she will take care of you in every possible situation feeding you home made hearty food, with an attitude so natural and inspired that you understand she couldn’t do anything else but feed family, friends and spirits with her genuine food and love for Middle Eastern cuisine. All the fondest memories of the days spent with Bethany are connected to food, no wonder at all. My first Lebanese lunch in Marylebone, a feast of meze so fresh and appetising, a rich chestnut and pumpkin soup in a late Autumn evening in Tuscany, the best hummus of my life to which I still compare all the other hummus I have the chance to savour, with an obvious winner all the times, incredible breakfasts with eggs, bacon, sausages, beans and… yes, one day we woke up with the smell of fried lamb meatballs served with a sour yogurt sauce. Well, that was probably too much for an Italian girl used to break the morning fast with milk, coffee, toasted bread and jam. Now you can enjoy all her recipes and bubbling personality thanks to her just published cookbook, The Jewelled Kitchen , photographed by another dear friend, Sarka Babicka. I read the book cover to cover, following the tracks of spices, family memories, recipes that I had the good luck to try at Bethany’s table and other imaginative dishes with exotic and fascinating names. Today is my turn to pick one recipe for the virtual cookbook launch! I knew from the very first moment which recipe I would have tried immediately, since we were talking about chickpea flour in a tiny kitchen in London about one year ago. Chickpea flour is a favourite of our Tuscan food heritage since it is the basic ingredient of the Tuscan cecina or torta di ceci, the typical street food of Livorno and Pisa. If you travel along the Italian coast to Liguria, there you’ll find the farinata, a pretty similar dish born from the same need of having affordable but substantial food to provide sailors and poor people with proteins and vitamins. 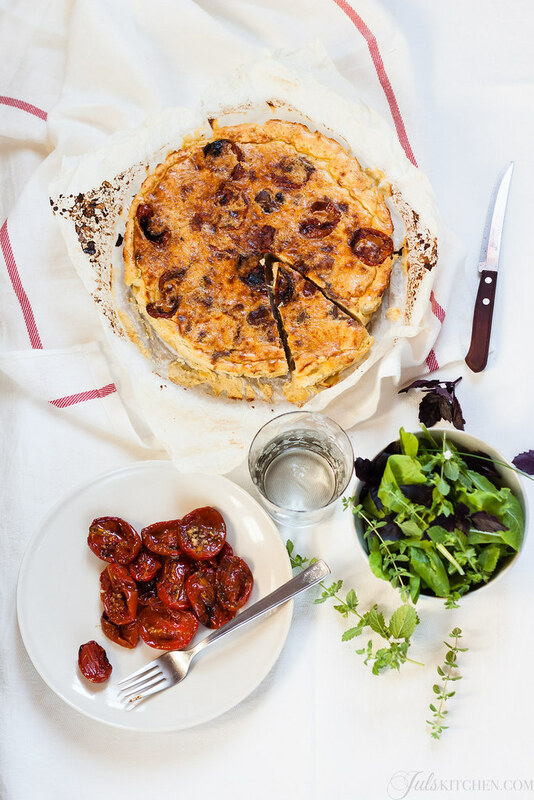 The same recipe is known as socca in Southern France. In her book Bethany presents her version of a North African quiche-like dish which, just like cinque e cinque from Livorno, is sold along the streets by the slice, sandwiched in a baguette. Yet another proof of the same culture of food and hospitality which permeates all the Mediterranean area. It is perfect as a main dish for a summer dinner in the garden with your friends, just heat it up slightly before serving if you want to make it in advance. Preheat oven to 180°C and lightly grease a 23 cm round ovenproof dish with butter. Heat half of the oil in a frying pan over a medium heat. Add the lamb and sear for about 2 minutes until cooked through, stirring often. Put the chickpea flour, cumin, salt, milk, eggs, harissa and remaining oil in a mixing bowl and pulse with a stick blender until you achieve a smooth, frothy, liquid mixture with an airy texture. 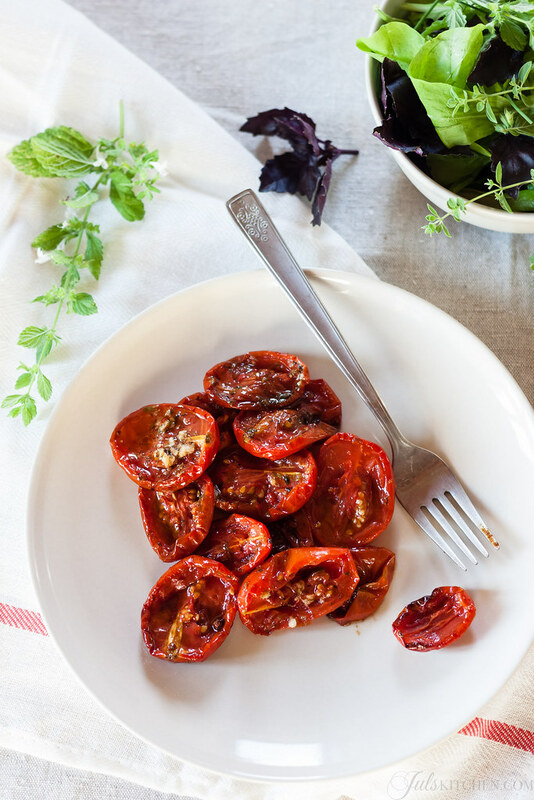 Add a little salt, but not too much because the sun-blushed tomatoes you will be using are already salted. Add the cooked lamb (discarding the oil and juices released after cooking) ans stir to combine, then pour the mixture into the greased dish and scatter over the sun-blushed tomatoes. Bake in the oven for about 20 minutes. During the last 5 minutes of cooking, change the oven setting to grill, then grill on high for the last few minutes in order to brown the top of the quiche. Leave to rest for a few minutes before slicing. Serve warm, sprinkled with more cumin if you like. P.S. Don’t miss the dessert! 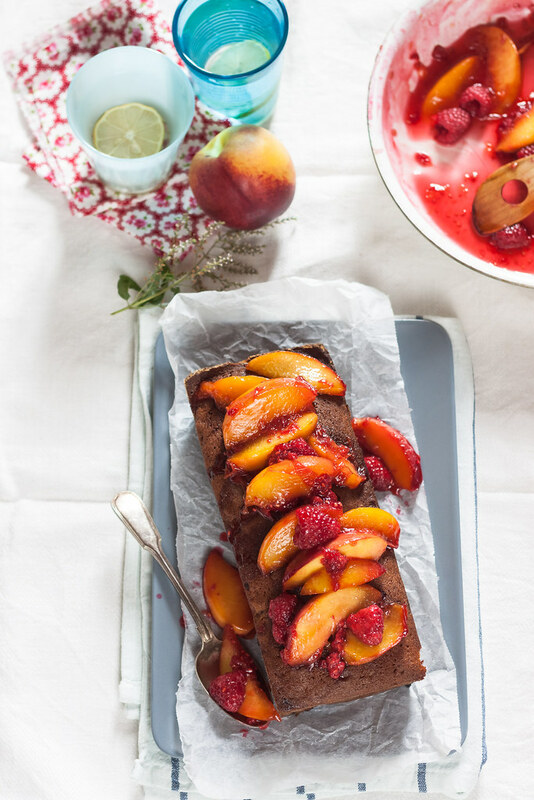 I baked a classic peach and raspberry pound cake for Great British Chefs, have a look and give it a try, it’s perfect for a summer afternoon cold tea! 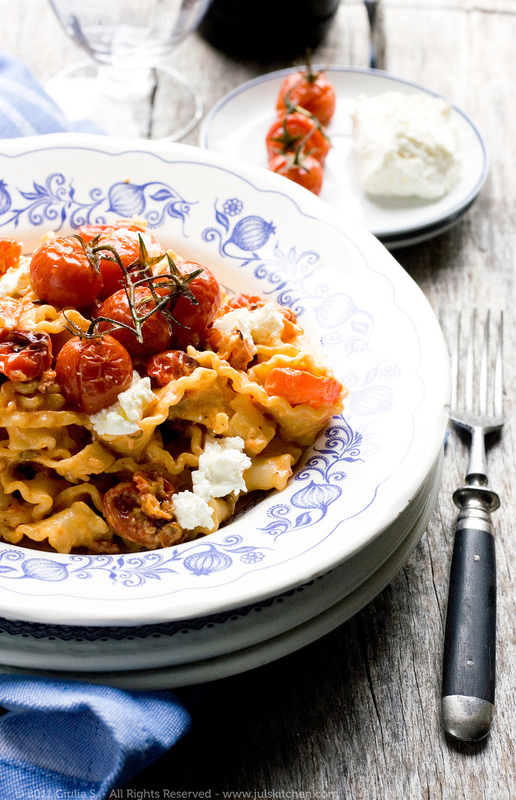 Ode to the melanzane alla parmigiana Sugo finto – The vegetarian version of a meat sauce Florentine’s style dried cod Mafalde with roasted tomatoes. Food bloggers pasta party. That is such a great idea. 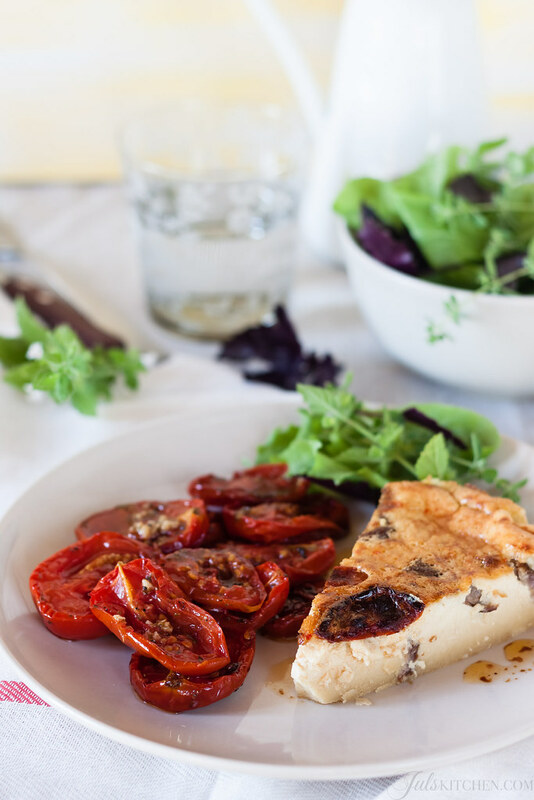 Brthany’s recipe sounds so good and your quiche looks absolutely mouthwatering. Would you check the measurement on the Harissa? Thanks! This all looks delicious, your photographs are great. I must get this book! If David Liebovitz is reading this he will swoon. He loves middle eastern food. I can’t wait to try the cake. What is Harissa? A brilliant gluten free recipe. The tea cake looks awesome too. Love your interpretation – and that you picked something that overlaps two cultures. So interesting to hear the Italian versions. It all looks delicious! Where is the recipe for the peach raspberry pound cake? Now I finally know how to use my chickpea flour. I am definitely sold on this recipe! As someone whose always loved quiche, that recipe looks fantastic. I would never have thought of using gram flour in a tart. Also, as a fan of Middle-Eastern cooking, The Jeweled Kitchen is certainly a book I shall look out for. Greetings from FBC5. I did not realise that chickpea flour was also common in Tuscan Cooking. I have no doubt that this tastes good as the food that Bethany made from her cook book at FBC5 was fab.